Washington – The U.S. Senate’s health care bill would result in “devastating” Medicaid cuts to Connecticut, reaching $2.9 billion per year by 2026 and stripping tens of thousands of state residents of health care, Gov. 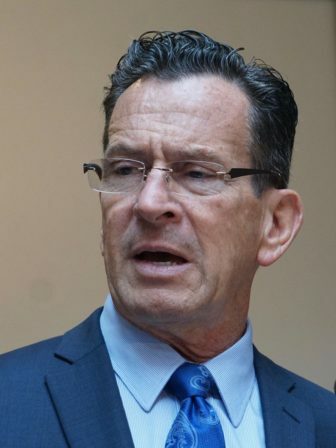 Dannel Malloy said Tuesday. The Republican Senate plan, known as the Better Care Reconciliation Act, would shift the responsibility for providing a health care system to the 50 states, while reducing the amount of federal Medicaid money for those states. The Medicaid cuts would be even deeper than those in the House-approved bill released last month. The governor’s analysis of the plan to repeal and replace Obamacare came as Senate leaders were forced to postpone a vote on the Better Care Reconciliation Act that was originally scheduled for Thursday. Because of a lack of Republican support to move forward on the bill, Senate Minority Leader Mitch McConnell said the vote will now occur after the Senate’s week-long July 4 recess. No Democrat is expected to vote for the bill and the GOP has a 52-48 majority in the Senate. To try to shore up GOP support, President Donald Trump invited all Republican senators to the White House Tuesday afternoon. The Better Care Reconciliation Act would transform Medicaid, the joint federal-state health care system for the poor, from an open-ended entitlement to a discretionary program with capped federal funding. Instead of paying 50 percent of all Medicaid costs in the state, and 90 percent of the cost of patients enrolled under the ACA’s expansion of the program, the Senate bill would provide federal per-capita payments to states and phase out payments for the 200,000 people who secured health coverage under Medicaid’s expansion. The Malloy administration said the Senate bill’s per-capita formula would dramatically reduce federal help to states like Connecticut that have higher health care costs, and would impose a penalty on states whose per-capita spending on Medicaid exceeds the national average by 25 percent or more. The result: States like Connecticut would be forced to pare down benefits to Medicaid recipients, reduce payments to hospitals and doctors and/or tighten eligibility requirements. “The anticipated funding reduction by 2026 is equivalent to 80,000 to 230,000 fewer Connecticut residents being served under Medicaid,” an analysis of the Senate bill by the governor’s office said. Besides undermining the coverage for the 200,000 low-income adults without children in Connecticut who were able to enroll in the Medicaid program when it was expanded under the ACA, the Senate bill would strip $6.8 million from federal funding of Planned Parenthood clinics in the state, a loss of money Malloy has promised to make up with state funding. In addition, more than $7 million a year would be lost because of the elimination of the ACA’s Prevention and Public Health Fund. The Senate health care bill also would cut Obamacare subsidies that help 73,000 low- and moderate-income families and children buy health insurance in the state exchange, known as Access Health CT. The ACA provides these subsidies to those earning up to 400 percent of the federal poverty level. The Better Care Reconciliation Act caps the payment at 350 percent of the federal poverty level. The governor’s analysis of the plan said nearly 6,500 Connecticut enrollees could lose their subsidies because of the lower cap. It also said financial assistance for low-income, older consumers would be slashed because the Senate bill would require them to pay 16.2 percent of their premiums compared to the current maximum of 9.65 percent. Subsidies under the Senate bill also would be pegged to the cost of a less comprehensive “bronze” plan, instead of the more generous “silver” plan the ACA uses. But Republicans who support the attempts to repeal and replace Obamacare say the system has resulted in dramatic increases in premiums and a flight of insurers from state exchanges. Access Health CT has two insurers left, Anthem and ConnectiCare, and neither has fully committed to sell policies on the exchange in 2018. On Monday, the Congressional Budget Office determined that the Senate health bill would result in an additional 22 million uninsured Americans by 2026. A separate analysis by the Connecticut Health Foundation said the elimination of the Affordable Care Act would result in a near doubling in the number of the state’s uninsured. It said an estimated 198,000 Connecticut residents under 65 are uninsured this year, but without the health law, it would likely be 45 percent higher, or 359,000. Connecticut’s Democratic Sens. 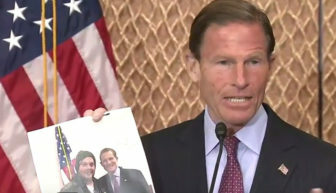 Richard Blumenthal and Chris Murphy have been vocal opponents of the Senate health care bill and have joined their party colleagues in trying to slow its progress. Sen. Richard Blumenthal speaking about the effect of the Senate health care bill on the opioid epidemic. On Tuesday, the senators joined other Democrats in a press conference to hit back at he bill’s cuts to federal funding to help opioid addicts. To Murphy, the Better Care Reconciliation Act is “a cascading horror” because it would allow insurers to cut mental health services that help people with adictions and also cut Medicaid funding to single adults and other patients of rural hospitals that treat opioid addicts. “There’s evil in taking money from people fighting addiction …and giving it to millionaires,” Murphy said. The Senate bill would repeal nearly $1 trillion in taxes established by the ACA. Many of those tax cuts would benefit the wealthy.